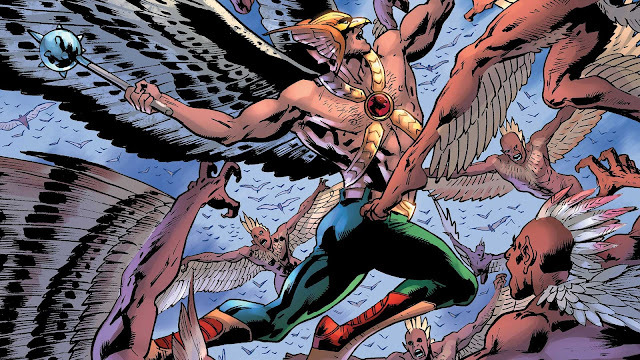 So you want to know about Hawkman? Well, so does he in this series where Carter Hall has realized that he's forgotten more than you'll ever know, but he plans on rectifying that because if he can remember his past, he may be able to stop a future he fears is coming. 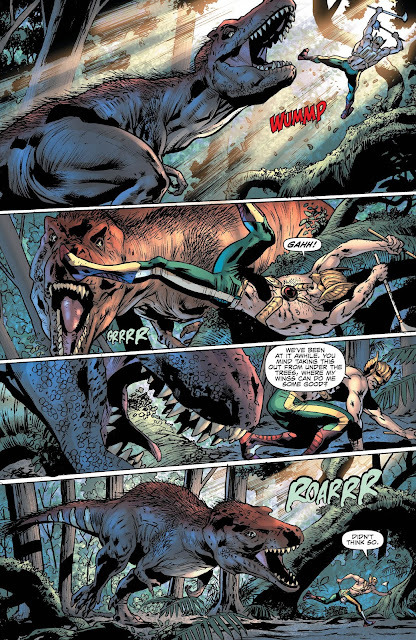 With that, we saw Carter head off to Dinosaur Island at the end of the last issue to continue his journey, but will time let him? I say that because he was forced to fight himself in ancient Egypt last issue and while I wish I understood exactly why that happened, I won't say that it wasn't fun. Let's jump into this issue and check it out. 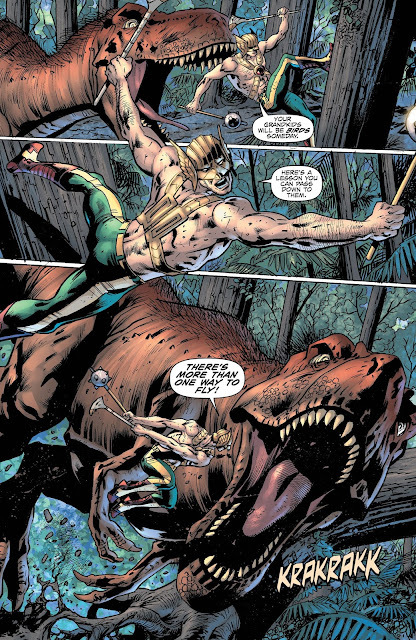 While I wish that Dinosaur Island was a place that you needed some sort of special device or talisman to get there like we saw in the Superman series, here Hawkman can just make his way no problem and start fighting T-Rex's to his heart's desire.......... Mostly, I wish this because I hate Dinosaur Island, but in this it doesn't do much to cause much disdain because it's only here to be some sacred place that is tough to get to and can hold a secret that Carter can uncover. The art in this issue continues to surprise me at how much I like it and the story itself.is fun overall, even though a lot of it is Hawkman's narration given to us through his journal, while he continues to be dumbfounded at what's going on. 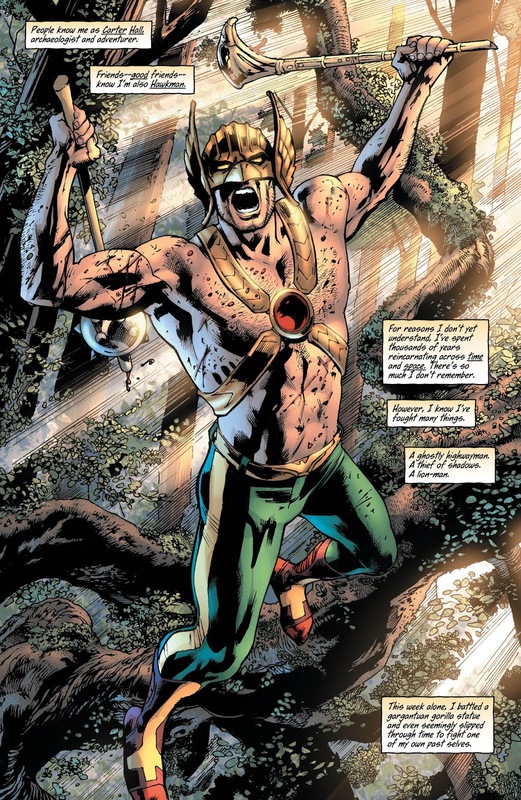 That's the biggest problem with this series so far is that we have no idea why things happen and while some of that can be put off with Carter just forgetting his past, the parts where he keeps jumping through time and space and hell, even his mace having a mind of its own in this issue come off odd and I'd like to have some information behind it besides for Carter just shrugging it off and going with the flow. Overall, besides for my minor gripes at wanting to know more in the third issue to a series and my dislike for Dinosaur Island as a whole, this series continues to be fun and has a mystery that I can't wait to get to the bottom of, while supporting some really decent art the entire way through. Yeah, I'd like to know more, but I guess I can't be mad at not knowing more than Carter Hall does at this point. 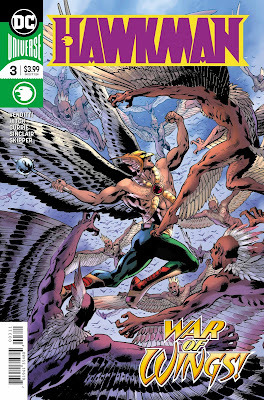 If you're not reading Hawkman yet...... Well, get on the trolley because you're missing out on some of the most fun at DC Comics right now. Strange locations, a forgotten mystery and a hero that will stop at nothing to prevent a possible dark future. I'm loving the art and the direction of this series and I cant' wait to read more.